Protect your large equipment with this large commercial grade canopy shelter. 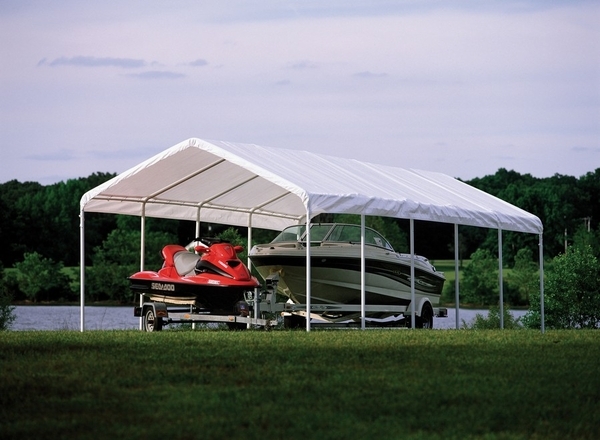 With a 10 year life expectancy, this canopy is totally tear resistant with its reinforced rip-stop cover. This product is UV treated inside and out with extra fade blockers, anti-aging, and anti-fungal agents added. The wide based foot pads form the base of each leg to create sturdy anchor points that are tested to endure rigorous weather conditions. This canopy is constructed from high grade steel and a full valance fitted cover. What is the height at the side and at the peak? The side height is 6'3" and the Peak height is 9'6". How far apart are the poles on this canopy? How many poles come with a tent? The poles are five feet apart. There are a total of 12 poles. Thank you for your interest! The frame is 2" diameter steel. Are window sidewall available for this particular item? Windowed sidewalls are not available for this unit. What is the actual OD (outer diameter) of the pipe used for the legs? Per the manufacturer, the legs are indeed 2 in. in diameter. How high is the side edge from the ground? The side edge is 6'3" tall. Are the foot pads removable? Is the tarp water proof and warrantied as such? The footpads are indeed removable. The tarp is 100% waterproof. The Shelter Logic Warranty is for exactly one year and covers the fabric as well. Thank you. This unit does not have a snow load rating. Thank you for your inquiry. The exterior height is 9 foot 6 inches so the interior would be 9 foot 4 inches since the frame is 2 inches diameter. The side height is 6 foot 3 inches. Can I get screen sides for this canopy? We do not offer optional screen mesh walls for this shelter. What is the total height and what is max clearance height for vehicles? 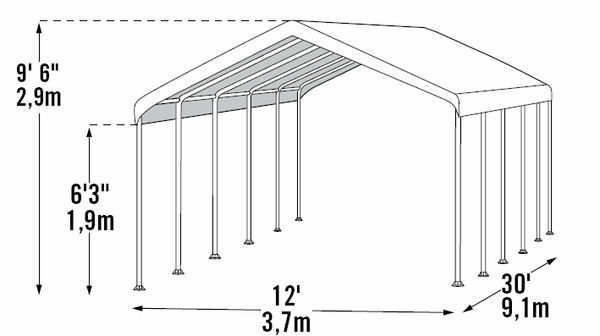 This canopy has a total peak height of 9'6" and a side pole height of 6'3". You can see the diagram illustrating these dimensions under the main photo on this item page. What is the diameter of the leg posts of this canopy shelter? They are 2" in diameter. Is the 9 foot 6 inch height measured at the peak or sides of this canopy shelter? The 9'6" is from the ground to the peak and the sides are 6'3". I'm curious - what is the gauge or mil thickness of the canopy material itself? The thickness is 5-1/2 ounce also known as 13 mil. Can I put a travel trailer in here? That would depend on the size of the travel trailer. If you have the dimensions of the trailer and it is smaller than the shelter then yes, you can use the shelter to store the trailer. Is there a flame certificate available for this item? My client bought this item and wants to use it for thanksgiving. The town needs a flame certificate to issue us a permit. Per the manufacturer's manual, ShelterLogic states the following: "Do not smoke or use open flame devices (including grills, fire pits, deep fryers, smokers or lanterns) in or around the shelter. DO NOT store flammable liquids (gasoline, kerosene, propane, etc.) in or around your shelter. Do not expose top or sides of the shelter to open fire or other flame source." Is 9'6" the pole height or the apex of the peak? 9'6" is the apex of the peak. You may view the inset picture below the main item picture for complete dimensions. Are there side panels available for this canopy? Yes, we do have the Enclosure Kit for that unit. The item weight is 290 pounds. Is there a storage box available for when the canopy is not assembled? If so, how big is the box? Unfortunately, there is not a carry bag for this product in our store. There are no directions in the box. Can I get installation directions online somehow? There is actually a product manual on this item page. Just look under "Related Articles & Product Manual". Had to do some filling to fit the pipes and get better steaks but it keeps things dry. ProsTall enough for my 22-foot pontoon boat. ConsPoor metal steaks and had to file holes to fit the pieces together. I don't know what headline refers to ? I have purchased about 4 of the vinyl covers previously and constructed my own frame. This time I purchased complete set. Only disappointment was I had to spend about 2 hrs filing the inside of frame fittings go remove weld pieces to allow the parts to go together ok. Probably need better quality control in this area. ProsI will be anxious to see how long the canopy cover lasts in Florida. This canopy should be assembled with (2) people. I managed alone, but size, weight, and bulk presented problems. A couple of connectors were welded crooked and needed straightening. I opted to replace hardware provided with 1/4" bolts-This was not necessary, just personal preference. While the sales ad claimed Commercial construction, it did not warn against not being rated for snow and wind loads. I re-enforced framework and install metal roofing panels instead of nylon fabric cover. I made changes to the original design, but am still happy with the product. ProsPackaging was good and product arrived without damage. Powder coat finish better than paint. ConsDon't like press fit of some tubing into connectors. Should be bolted. Frame sways side to side and front to back. I provided support cables to prevent this. I was shorted some hardware, but then I replaced them with my own bolts. Surprising that most of the tubes connect with a simple interference fit, but it is impressive how accurately the components work together. We get a lot of rain and wind and with a few anchors on the feet this canopy is very stable. I'd give it 5 stars if the tarp/cover were a bit heavier gauge. It seems a tad fragile as if it may only be a 2-4 season survival item.